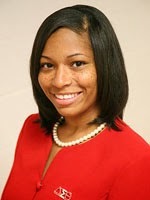 Wildcat Dreams is Fort Valley State University President Ivelaw Lloyd Griffith’s biweekly e-newsletter. As an additional resource to stay connected to FVSU, Wildcat Dreams highlights various campus activities and updates about new initiatives and programs. Readers are encouraged to share the newsletter with friends and family. We welcome your feedback. Please send comments to fvsu_pr@fvsu.edu. Thank you and happy reading! 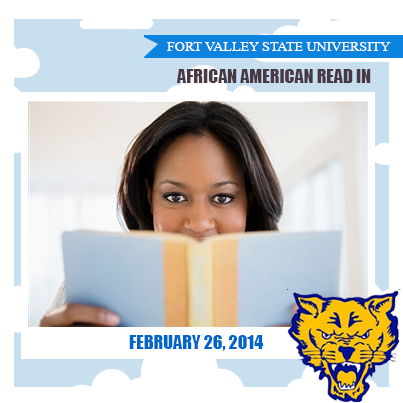 Read more news on the FVSU Review. Jasmine Danielle Bowers is this month's Featured Alum. 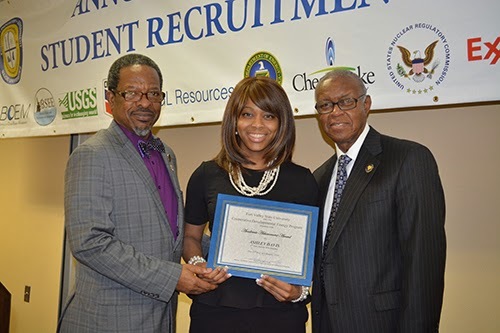 Fort Valley State University alum Jasmine Danielle Bowers’ efforts to educate youths about financial literacy has resulted in her recent recognition by a national online magazine. The 22-year-old, who was named to the 2014 Young Futurists list, was identified as one of the nation’s rising stars by The Root, an Internet news and opinion site that is published by the Slate Group. The online publication honored 25 individuals from across the country, ages 16 to 22, “who are forging a path to future greatness." According to The Root, the honorees have distinguished themselves in the areas of social activism and justice, enterprise and corporate innovation, science and technology, green innovation and arts and culture. Additionally, the young adults had glowing recommendations from teachers, mentors, advisers, employers and associates. Fort Valley State University’s ninth president Ivelaw Lloyd Griffith assumed the helm of campus seven months ago in July 2013. Since then, Dr. Griffith has instituted a whirlwind of changes designed to encourage scholastic excellence on campus an students’ continued intellectual growth. Next month, the campus and the University System of Georgia will officially celebrate Dr. Griffith’s official inauguration as Chief Wildcat during an Investiture Ceremony at 10 a.m. Friday, April 11 in the Health and Physical Education Complex. Preceding the inauguration will be an entire week filled with events that illustrate dreaming and doing in scholarship and professional pursuits. Highlights of the week will include a John W. Davison Lecture series on the Cultural Celebration of Excellence Engagement in Founders Hall, featuring Babacar M'Bow, chief curator at the Florida Africana Studies Consortium in Miami, Fla. 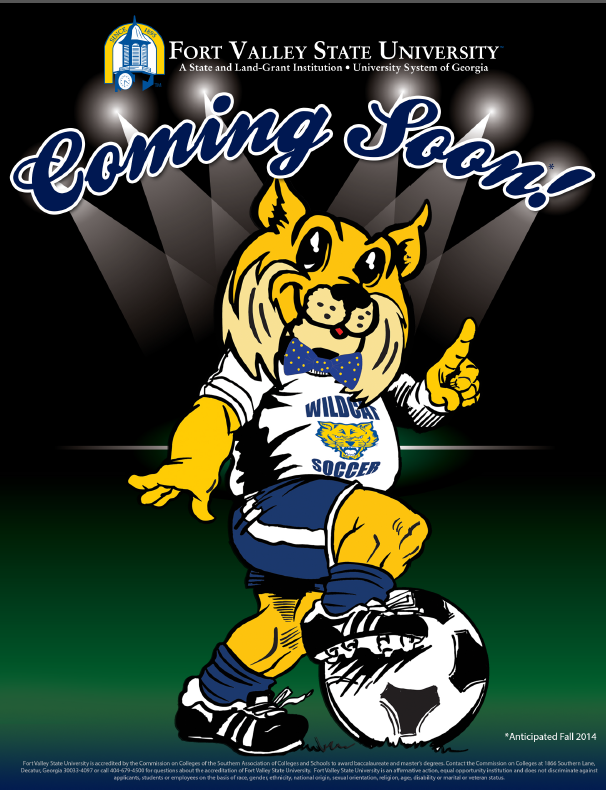 The week-long festivities will end with a soccer exhibition game by FVSU’s new intramural soccer team. For more information, contact FVSU's Office of Marketing and Communications at (478) 825-6319 or visit www.fvsu.edu/inauguration. Join members of the FVSU community in volunteering one hour of service in honor of President Ivelaw Lloyd Griffith’s inauguration. A Fort Valley State University student made the cut for a national list that featured the best and brightest scholars from Historically Black Colleges and Universities across the nation. The White House Initiative on Historically Black Colleges and Universities (WHIHBCU) named FVSU English major Elijah Porter as one of 75 HBCU All-Stars. Porter also is currently interning in the Office of Legislative Counsel at the State Capitol in Atlanta, where he serves as a resolution writer and legislative aid. He is the first from FVSU to be hired for this internship position. In addition to his current internship, Porter will serve as an ambassador of the White House Initiative for the next year. His activities will include attending regional events and web chats with Ivory Toldson, deputy director of the WHIHBCUs. Forty-five women and thirty men were selected as All-Stars. Student Ashley Davis was awarded a certificate for having the second highest Grade Point Average at the CDEP Annual Energy Career Day Luncheon on Monday, Feb. 28. Six students from across the country were recently awarded scholarships totaling $300,000 as part of a Fort Valley State University program designed to increase the number of minorities and women within the disciplines of science, technology, energy and math or STEM fields. Under the Cooperative Developmental Energy Program, students were offered individual awards valued at $50,000 each that will cover tuition and fees over five years of college. As part of the program, students will receive both a degree from Fort Valley State and a second from another partnering institution. 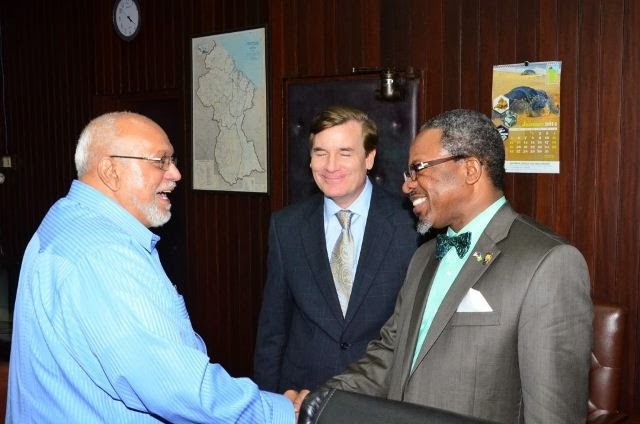 Guyana President Donald Ramotar (left) meets with FVSU President Dr. Ivelaw Lloyd Griffith (right) and U.S. Ambassador for Guyana D. Brent Hardt (center) before the parliamentary meeting. Two Fort Valley State University officials recently toured several Caribbean nations in a bid to forge international partnerships and recruit new students to the university’s campus. FVSU President Dr. Ivelaw Lloyd Griffith was initially invited to speak about Caribbean security issues and America’s bilateral agenda in Guyana, as part of the U.S. Public Diplomacy Speakers’ Program. President Griffith saw the invitation as an opportunity to expand FVSU’s global reach and he included Dr. Govind Kannan, FVSU’s interim vice president for academic affairs, on the trip. The Speaker’s Program—initiated by the Under Secretary for Public Diplomacy and Public Affairs—is part of a United States government program that supports U.S. foreign policy goals and security interests by strengthening relationships with international countries. FVSU scholarship recipients and administrators pose for the cameras after the luncheon on Feb. 17. More than 700 Fort Valley State University faculty, staff, students, alumni and supporters recently gathered in the Health and Physical Education Complex on the main campus for the university’s 27th annual scholarship luncheon. The Feb. 27 event, hosted by the FVSU Foundation, Inc., is the institution’s largest annual fundraising event for student scholarships. It also provides an opportunity for scholarship recipients to meet the donors who have generously provided funds to aid in their education. President Griffith receives $15,000 check from Blue Bird Chaplain Jay Jones and the Vice President of human resources and external affairs Mike McCurdy. Fort Valley State University’s new Honors Program recently received a financial boost when the nation’s primary bus manufacturer donated $15,000 to support the institution’s scholars. Blue Bird Corporation is the first corporate underwriter for the program that debuted last year in an effort to provide academically rigorous offerings and an enhanced academic experience for motivated scholars. So far, the program has 25 charter members. Blue Bird Company representatives Mike McCurdy, vice president of human resources and external affairs, and Jay Jones, a chaplain for the company, presented the check to FVSU President Ivelaw Lloyd Griffith on Feb. 19 on the main campus in Fort Valley, Ga.
Michigan Senator Debbie Stabenow addresses FVSU crowd and reporters. Congress recently passed a sweeping farm bill that may have significant impact on the lives of everyday Americans. After a lengthy, three-year battle, the U.S. Senate approved the Agriculture Act of 2014 (also known as the 2014 U.S. Farm Bill). The $956.4 billion package passed with avote of 68 to 32 earlier this month. The historic measure, which was signed into law by U.S. President Barack Obama, not only establishes five years of farming policies within the nation, it also sets aside money to feed the nation's poor through the Supplemental Nutrition Assistance Program (SNAP) and provides grants to support farmers. This week, Michigan Senator Debbie Stabenow, the farm bill’s author and chair of the U.S. senate’s agriculture committee, made a special stop at Fort Valley State University to discuss the new legislation’s potential impact on local farmers. During the event, FVSU President Ivelaw Lloyd Griffith also announced the proposed creation of a new Center for Homeland and Global Food Security on the university’s campus. Dr. Mark Latimore, interim dean for the College of Agriculture, Family Sciences and Technology, explained the reason for Stabenow’s visit to FVSU. “Senator Stabenow loves land-grant institutions, since she graduated from Michigan State University, America’s first land-grant college,” Latimore said, who explained that President Obama signed the historic bill at the senator’s alma mater. 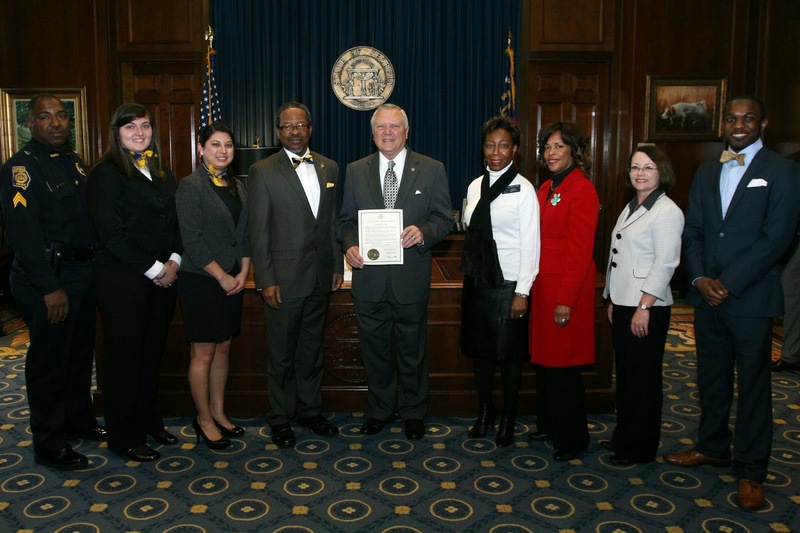 President Ivelaw Lloyd Griffith (center, left) receives commendation from Georgia Gov. Nathan Deal (center, right). Georgia Governor Nathan Deal recently honored Fort Valley State University with a special commendation honoring the campus’ innumerable contributions and continued impact on higher education. On Feb. 26, President Ivelaw Lloyd Griffith, members of his cabinet, and three FVSU students traveled to the State Capitol to receive the commendation. The commendation was presented to Historically Black Colleges and Universities, like FVSU, in honor of Black History month. Nathan also honored four additional HBCUs: Morehouse College, Albany State University, Spelman College and Clark Atlanta University. “Georgia’s historically black colleges are rich in history, beauty and talent. Their past, present and future are a source of great inspiration for young African-American scholars,” Deal said. For details, contact the Office of Marketing and Communications, (478) 825-6319. A top United States policy group recently published a study by Fort Valley State University’s Chief Wildcat. The William J. Perry Center for Hemispheric Defense Studies issued FVSU President Ivelaw Lloyd Griffith’s occasional paper “The United States and the Caribbean: 30 Years after the Grenada Invasion Dynamics of Geopolitics and Geonarcotics” this past December. Created in 1995 and named after a former Secretary of Defense, the William J. Perry Center for Hemispheric Defense Studies is an academic institution that provides instruction, research and outreach on defense and security issues affecting the Americas. The organization, located in Washington, D.C. , seeks to promote professional ethics in governments’ decision making process; foster teamwork and strategic leadership; and stimulate innovation in the security sector of new ideas. An occasional paper is a stand-alone publication on topics that offer new perspectives and insights of either an historical theme or current event. Griffith’s new study examines how global forces and geonarcotics, have affected the Caribbean region. The scholar-president, who is a political scientist, traces how these trends have evolved within the region since the 1983 U.S. invasion of Grenada. Incidentally, President Griffith coined the term “geonarcotics” in the early 1990s as a concept to examine the narcotics issue holistically. Additionally, in the occasional paper the president examines some of the new international actions of nations such as China and Venezuela within Caribbean nations’ political and economic spheres. The William J. Perry Center has published other studies by the president, including a policy analysis entitled “Political Acumen and Geopolitical Anxiety in Suriname” in the organization’s Security and Defense Studies Review in 2011. To read President Griffith’s newly released policy paper, visit http://www.fvsu.edu/files/pdf/Thirty-Years-after-the-Grenada-Invasion.pdf . FVSU students model their best bow ties during the first Bow Tie Thursday on Feb. 27. A spotted blue and gold bow tie. FVSU students demonstrate how to properly wear their bow ties. Fort Valley State University students sported their trendiest styles at an event that celebrated Dr. Ivelaw Lloyd Griffith’s favorite fashion accessory. Jammin’ in the Café held its first Bow Tie Thursday on Feb. 27 in the FVSU Cafeteria. The event was sponsored by the FVSU Power Jamz 104.3, Sodexo and FVSU’s Office of Campus Life. Ladies and gentlemen Wildcats wore colorful bow ties to the party. Inside the Caf, students bobbed their heads, dancing to hip hop tunes spun by A.J. The D.J. Other Wildcats watched their daring peers sing karaoke music and answer rapid-fire trivia questions. During the night, a few lucky Wildcats walked away with door prizes. For additional pictures, visit our Flickr site. Wildcat Battalion take an oath at the ROTC Contracting Ceremony recently. A new class of Fort Valley State University's Wildcat Battalion cadets raised their right hands and confirmed their commitment to become Army officers at a recent public ceremony. The Wildcat Battalion held their Army Reserve Officers Training Corps' Contracting Ceremony on Feb. 6, in the C.W. Pettigrew Center. Lieut. Col. Joel Davis Jr. and Master Sgt. Scottie Johnson presented certificates to newly contracted cadets. For more information, contact FVSU's Military Science Department, (478) 825-6340. Fort Valley State University recently received funding to continue an alcohol awareness program aimed at reducing the number of drunk driver crashes among college-age students. The $6,500 grant was awarded to FVSU’s counseling center, Valley Behavioral Health Services, by the Georgia Governor’s Office of Highway Safety. The grant will be used to continue the center's Georgia Young Adult Program by funding its Peer Educator “Be the Sober One” initiative. The initiative educates students about the risks related to alcohol and substance-abuse, especially while driving. According to a recently released study, the National Highway Traffic Safety Administration reported a 4.6 percent increase in fatalities resulting from drunk-driver related accidents. In 2012, more than 10,322 lives were lost compared to 9,865 in 2011. 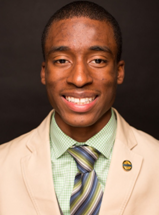 Anthony Boynton, an FVSU junior, will be attending the Ralph Bunche Summer Institute in June. Anthony Boynton, a Fort Valley State University senior majoring in English, always knew he wanted to teach in a classroom. During high school, the scholar’s intelligence earned him the affectionate nickname “Professor Boynton” from his friends and peers. Even after matriculating onto FVSU’s campus, the nickname stuck. Today, the FVSU student’s dreams are one step closer to fruition. This summer, Boynton will attend a summer institute in California that prepares minority students for success in graduate school. The eight-week institute at the UCLA Bunche Center for African-American Studies Humanities Institute will be held from June through August. The program will provide Boynton with on-campus housing, meals, a stipend and $450 for transportation. Bookworms read passages from novelists and writers that motivate and inspire them during a special Black History Month event at Fort Valley State University’s campus. The university’s Department of English and Foreign Languages held its African-American Read In on Wednesday, Feb. 26, from 10 a.m. to 4 p.m. on Hunt Memorial Library’s third floor. Wildcat students, faculty and staff were encouraged to bring their favorite African–American authors to read for 5 to 10 minutes, or material can also be provided for interested readers. The 2014 National African-American Read-In was initiated by the Black Caucus of the National Council of Teachers of English, and the National Council of Teachers of English. NCTE is a professional association of educators of English studies, language arts and literature studies. Every February during Black History Month, read-in events are held at campuses throughout the country. President Griffith speaks to the cabinet about upcoming initiatives. Dr. Melody Carter, vice president of external affairs, addresses the cabinet. President Ivelaw L. Griffith recently hosted a special 4R Cabinet Meeting in an effort to develop enhanced strategies for supporting the improvement of recruitment, retention, and release "graduation" rates, The two-day meeting was held Tuesday, Feb. 25 and Thursday, Feb. 27 and also included discussions on seeking strategies to improve the university’s revenue. 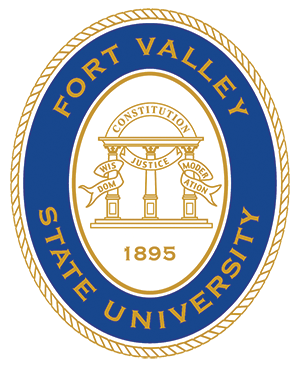 Fort Valley State University. Picture Window theme. Powered by Blogger.